What are the import procedures in Italy to move goods? How to import to Italy? Explain about import registration process, cargo movement to Italy from overseas countries, Import delivery process in Italy etc. This post explains about step by step procedures that need to be finished with Italy government authority for importation to Italy. For starting an import export business you should enlist as a taxpayer with Italy Tax Authority. A registered trade with concerned license as per the business is must for exporting and importing of commercial products from and into Italy. Italy falls under EU countries, a common trade policy is adopted to import most of the products. A separate rules and regulations are applied to specific products when importing and exporting in the European Union called Integrated Tariff of the European Communities (TARIC code). For any import, export or transit in EU countries, an EORI number is compulsory. EORI means Economic Operator Registration and Identification. The European Union (EU) legislation has required all member states to adopt the Economic Operators Registration and Identification (EORI) scheme. All importers, exporters and other transporters need to use a unique EORI reference number in all electronic communications with Customs and other government agencies involved in the international trade. This means that anyone involved with export, transit or import operations need to have EORI number. Agenzia delle Dogane, as a customs authority, it ensures the full compliance with the community legislation, carries out control activities, assessment and verification with regards to goods circulation and to internal taxation related to international exchange. it works to prevent illegal trade of counterfeit products and also facilitate genuine trade. they collects statistical data inorder to prepare the trade balance. The documents may have to be prepared in a particular way to comply with the requirements of the import or export country. The import documents required in Italy depends up on the nature of goods importing regular trade policy of Italy Government, specific goods importing to Italy. 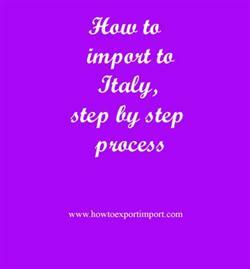 This post explains about different phases in import process that every importer needs to go through in Italy. How to import to Brescia? Formalities for import to Brindisi. Procedures to import to Cagliari. Need to import to Catania. Explain to import to Cuneo. Information to import to Florence. Step by step process to import to Genoa. Methods to import to Lamezia. Guidelines to import to Milan Please guide to import to Naples. Help to import to. Procedures required to import to Olbia. Requirements to import to Palermo. Clarifications to import to Perugia. How can I import to Pescara. What should I do to import to Pisa. Sikandar Sinha: On 09 May 2018 We ship roughly 5-8 containers from Italy to India every month because of supply chain team manages everything from Dubai. It’s easy, fast and much cheaper.